I will attempt to copy as much discussion as I can find related to camper box mounting and pivot frames that is spread all over this forum into this thread. If anybody else has some time and wants to start, please do. I'll try to add in the info on 4 point frames and other designs as soon as I can. Would you be willing to post pictures of your U500 / Unicat 4 point mount? Consolidate all relevent posts about camper box suspension / pivot frame systems into one place. Engender and facilitate discussion about this topic. Provide an authoritative resource for people designing, building and using expedition campers who wish to learn more about this topic. The majority of the initial posts in this thread will be copied from other threads. Quotes contained in these initial posts will refer to posts that may not exist in this thread. I do not follow, read or monitor threads or topics other than Mitsubishi Heavy Truck and a little bit on General Expedition Camper Discussion and Modifications. I will not be aware of those threads/topics and am unlikely to include those posts in this thread. There are undoubtedly threads in other areas that contain relevent discussion. I encourage others to copy those posts into this thread. There will be little to no attempt to maintain time or topic continuity when I copy and paste into this thread from other threads/topics. There will duplication and repitition between posts. The Fuso FG has a very flexible frame. Unlike light duty trucks or standard road medium and heavy trucks, the frame is design to twist, somewhat like a Unimog's frame is designed to twist. The torsional twisting of the Fuso FG frame can introduce forces into any payload that is rigidly mounted to the FG frame. If a designer/builder/owner wishes to isolate their payload from the torsinoal forces of the Fuso FG frame, a payload (camper box) suspension or pivot frame system can be implemented. The purpose of a payload suspension or pivot frame system is to isolate the payload from the chassis frame, not to reinforce or strengthen the chassis frame. Unimogs successfully employ 3 and 4 point pivot mounting systems for vehicle components (engine, cab, etc.) and payload. There are no known fact/science/engineering based publicly available reference sources for analysis of potential payload suspension / 3 or 4 point pivot systems for the Fuso FG. If you know of or find others, please post them in this thread. On the Hackney truck, I think the 3 point mounting, frame extensions, and weight may have amplified the stresses in the frame significantly. With this 4 point mounting to distribute the forces, standard frame, and lighter weight, I think I should be good as-is. I agree with your assessment. Those considering a 3 point design need to make certain that the amount of weight they are proposing to load onto two widely separated points on the FG frame are within its design limits. Believe me, you do not want to discover that in some remote corner of the planet. The extremely important issue with the Fuso frame is that like nearly every truck in its class, the frame tapers down to a small cross section aft of the rear axle. Check the section modulus diagram of the stock frame to get an idea of how much weaker that section of the frame is than the area in front of the rear axle - 45.9 cm(3) / 2.8 in(3) vs. 72.3 cm(3) / 4.41(3) - nearly half as strong. The issue with 3 and 4 point pivot frames is the load point aft of the rear axle. I have no way of knowing what load we were putting on our mounting point back there, but whatever it was, it was too much. Michel reports his FG frame also bent back there with a 3 point pivot design. You may have no problem for a long time; we didn't for more than a year, and during that time we were on some very challenging roads and tracks at a higher weight than when it bent, cracked and broke. But all it takes is one winching, one unseen-in-time speed bump, one big rock in the dark, or one whatever and you could have a problem. A four point design will help distribute the weight of your payload over three places on the frame instead of two. IMO, it is a good choice. If you are not going to reinforce it back there, be careful how much payload weight your design can possibly pivot towards the rear. I plan to convert our payload to a system that distributes the load over the length of the entire frame. It is my opinion that our payload was too heavy for the stock frame when loaded onto the two points that were so widely seperated. In addition, the rear load point is located on the rear tapered section of the frame, which is significantly weaker than the forward sections of the frame, as illustrated below. Note that our frame was not reinforced, sleeved or boxed anywhere other than the fully boxed frame extension of 17.8" / 452.1 located at the bottom of the step-down section. The body builder's guide will give you detailed information on the clearances required for rear suspension movement, etc. "The sharp edges of the body or bed mounting cause stress risers which sort of amplify the load stress onto the frame. All Fuso BBMs recommend either tapering some oak boards up and away from the frame on the ends, or cutting stress relievers into the subframe at the ends. The angled "fishmouth" notches cut into the ends of the subframe massively reduce the stress on the flanges. If I left those square, even the much stronger FM frame might break there. It IS ENTIRELY POSSIBLE that you could have broken your frame even under weight capacity!" So, the message is, be sure to taper the load you are placing on the frame on the ends of any subframe mount. If you just cut them off straight or have a flat end on them as we did you could be introducing stresses that the frame will not be able to handle. Again, try contacting Fuso engineering. The worst they can say is "no," or perhaps worse, "that's a really dumb idea," but it's better to find out now than later. Darrin says he iterated many designs with them prior to his first build on an FG and found them very helpful. this perhaps will bring the front mount almost 2.5 feet or a little more back from the cab right where the reinforcement plates are for the step down frame, the back one will be in from the end almost 4 feet (which includes the 2 additional feet added because of the 14 foot flatbed) putting it very close to the rear spring shackles. Please see the comments above regarding "stress risers" in the frame. 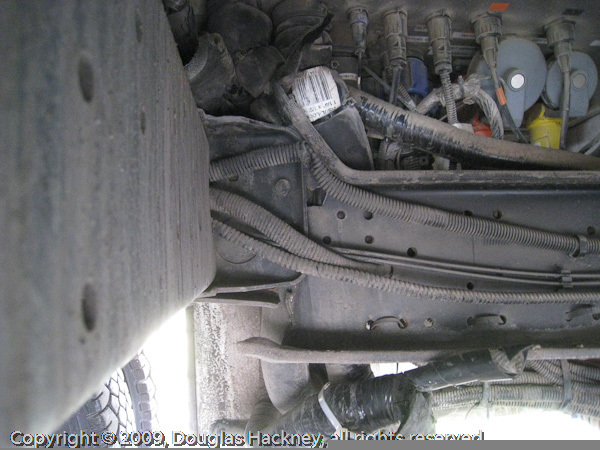 The two most stressed points on a typical truck frame are right behind the cab and at the spring shackles. You are proposing putting your two load points directly on those spots. This would probably be a very good design to have the Fuso North America engineers review and comment on prior to implementation. Here is an informative article on truck frames, modifications, etc. Thanks for posting that link on truck frames. At the end of the piece he writes that it is better to rigidly attach a body at the rear and float it at the front. Can anyone explain why this is the case? My service body is bolted thru the web and welded to the frame at the rear and u-bolted at the front so it seems to have been mounted with similar advice in mind. Great input on frame stress...I'm coming up with some ideas about how to distribute the load over a larger area than what I have now, with some minor changes. I do agree with what lehel is saying about moving the front and rear mounting points in a bit so they aren't right at the edge...if you think about it this allows an even distribution of weight so each mounting point carries an equal load. The photo makes the rust look kind of bad, it really isn't very deep! I probably need to brush down the trouble spots and repaint. Note the difference between your pivot point mounting (which looks very similar to ours) and Darrin's. Darrin spreads the load of his mount longitudinally along the frame with the yellow sections that end with the "fishmouth" cutouts. You could do the same by notching or shortening the flange section on your pivot. Note that your rear mount is in an area of the frame that is significantly weaker than where your other mounts will be placed. By having all the weight carried by the two brackets and the U channel of the pivot mount, you are loading the frame only in that short section; it will be a stress riser in an area of the frame that is already, by design, weaker than the forward parts of the frame rails, as well as very close to the spring shackles. If you don't implement the type of load distribution rails that Darrin used, consider using extended brackets that would spread the load along the frame web. Be sure and angle them at 45 degrees or less, just like the ends of a frame reinforcement (the angle is to minimize or eliminate stress risers - details in the body builders manuals - page 8 here: http://www.hackneys.com/mitsu/docs/fusoframemodificationinfo.pdf). great info ?? thanks for the note and all the great info doug, i am planning on starting a new thread for our project ; ) i hope i havn't intruded in anyones space here. i myself have enjoyed talking with darren the last couple of years about expedition campers, it would be great to have him do a detailed writeup on his projects one day ?? one area we are now looking very closely at is the load from the bottom up, or the suspension end. the overall goal for these type of campers seems to be to allow the truck frame to twist naturely. as well we'd certainly like to prevent a camper subframe from twisting and destroying a camper box. a novel approach if it was possible might be mounting a camper subframe right on to the spring shackle mounts at the front end as well as the rear suspension. the truck would have its own supporting structure, and the camper subframe on its own independant from each other. a camper 2 or 3 point subframe will put undue stresses on the trucks frame regardless of how or where it will be mounted. our regular style working flatbed on our new fg is mounted sitting on top the whole frame and then u-bolted. the truck frame has reduced twist now but very evenly supported on the frame. although the flatbed can have some twist as well now. anything less than this gives the frame more twist but less mounting surface. hope i'm not babbling to much here. anyhow, i bring this idea up as something to add to our overall view, as we're all finding it can be quite a feat to try using the trucks frame with the suspension mounting points pushing from the bottom against the mounting points from our camper subframes pushing against the frame in the other direction. as we extent away from the suspensions mounting points the frame will now have a new twisting action against the nature twist were trying to keep. the frame as a whole will flex up and down agains't the suspension mounting points creating hot spots at different spots along the frame which could very well cause severe cracking. along with this it can be made even worst by a heavy built camper swinging back and forth extenting the frame twist beyond its cabability creating more hot spots. the unimog design seems to be less affected by the frame stresses as the drive train is all very connected by its own support work. an example is the rear end diff alignment is not connected or controled by the rear suspension but is connected to the sealed driveshaft tube by supporting tubes. the rear suspension itself only controls up and down movement via coils. The Fuso FG is more comparable to the new generation UGN (U500 in the U.S.) rather than the classic Unimogs. The U500 uses the same basic design as the FG: ladder frame and standard drive train and suspension (no torque tubes). Obviously, major differences include coil spring suspension, GVW (33k) and the portal axles. I think you would find a separate suspension for a camper platform attached at the spring shackles would add unnecessary weight and complexity. In terms of spreading the load down the length of the frame rails, I agree that this method is the best possible solution to avoid hot spots, stress risers, etc. By bolting a platform rigidly to the frame, you limit or eliminate the FG frame's inherent flexibility, which is an important part of its strength. Think of the difference between a flexible tree that bends with the wind and a stiff tree that doesn't. The flexible tree survives a wind storm. With a rigid platform, the strength of the platform becomes the limiting factor for all stresses introduced into the frame. With the wet-noodle flexibility characteristics of the FG frame, this does not bode well for the long term survival prospects of said rigid platform. Consider instead a system that spreads the load across the length of the frame but still allows the FG frame to twist at will. Check out the system used by All Terrain Warriors and consider the use those FGs are subjected to, especially their commercial off-road tourist buses. I think they've got it figured out. I sure wish I would have known about those guys before we started. Rigid mounts should be used at the rear and flexible mounts at the front. The front mount should not be at the front of the body. Toner said there are three basic types of body mounts: flexible, rigid, and combination. Rigid mounts should be used at the rear, and flexible mounts at the front. He said that even though U-bolt body mountings are popular, they are among the least effective mounting systems. He said if they are used, proper frame spacers must be used. Some of the problems are loosening, not preventing forward movement of the body, and frame damage. He said frame flanges should never be notched for a body mount. I know I don't want to sound like a scratched record about not using pivot frames on FG's but could I just say that Toner's advice applies to these trucks perfectly. This works. Except the statement earlier in the article about moving the rear axle rather than extend the frame. I'm sure he didn't have a tapered FG frame in mind when said that. Obviously this guy is not just an engineer and has done his fair share of time on tools out in the workshop. Kerry, when we see rigidly mounted bodies on FG's that have sustained damage, for whatever reason, it's always the front mounts that are the worst. Maybe a little damage in the middle and never at the rear. This maybe on trucks where the weight is evenly distributed too. That was how my boss started to develop our flexible mounting system nearly 20 years ago. By looking at where the mounts tried to tear apart and making the correct allowances. Not on road trucks but mainly eco tour buses and offroad work trucks where the frames are exposed to a lot of twisting and jarring. I presume your body has rails that sit along the chassis and they are u - bolted. Chip posted some pics months back (lost???) of a truck that had springs between the nuts and the flat bars of the u bolts so they had some give/stretch. Although I noticed in the pics that the springs were wound so tight that there was no movement possible anyway. But the intention was certainly there.Why don't you think about that if you're worried? As Toner says if you stay with the u bolts one of the problems is loosening > well, sprung u-bolts would be the same thing as a loose ones, so you also have to try and stop the body from moving sideways at the same time as allowing it to move up and down. The forward movement he mentioned should be prevented by your rear mounts. If (and only if) you are worried about damage, this will be infinitely easier for you to do than some of the alternatives being discussed. Mind you, I'm only going on what you've described about your truck but IMO this will be a much safer option too if done correctly. Darrin must be a bit of a perfectionist , heh? Really good quality work from what I can see in the pics. If ever we have to sit a box section or channel ontop of a chassis rail (and this is rare), the Australian body builders guide gives an option of tapering the section up and away from the chassis at the ends instead of the "Frogmouth" ends. IIRC the taper has to be longer than the section is high and without looking it up, I think the angle is about 1 in 20. I'm not that worried about the mounting on my truck although I had considered the spring loaded u-bolt option. I'm more interested in trying to understand what is going on with frame stresses and body mounts. My attitude towards my own truck is almost totally pragmatic and un-theoretically informed. The service body has been on my truck for 10 years. I've seen no evidence of serious damage so far. There is evidence of a slight crack in the sheet metal at the front of the service body which was welded but that could have been caused by something other than frame/body interaction. I like the storage that the service body offers. I also like the fact that it can accept a truck camper. So I'm willing to experiment and see if the system holds up over time. But my example does raise some questions. From what I can gather most commercially sold FG work trucks don't have complex and elaborate body mounts. Why are expedition camper builders more focused on complex mounting systems compared to the commercial markets? I've seen the pictures with FG wheels on very uneven ground to indicate frame flex and how pivot mounts handle this flex. But my guess is that expedition FG campers are only rarely exposed to those kind of extreme frame flex inducing conditions. Is it wise to build for those conditions or do as the commercial body installers do? Or, if frame flex is something that should be considered under all conditions and not just extreme conditions, why aren't commercial truck body installers using pivot mounts of some kind? If ever we have to sit a box section or channel ontop of a chassis rail (and this is rare), the Australian body builders guide gives an option of tapering the section up and away from the chassis at the ends instead of the "Frogmouth" ends. IIRC the taper has to be longer than the section is high and without looking it up, I think the angle is about 1 in 20. Note especially the last page regarding mounting on an FG. Why are expedition camper builders more focused on complex mounting systems compared to the commercial markets? With the FG frame, you really do need to allow for frame flex stresses on your payload if you are going anywhere other North American paved or graded roads. If you come out here, you will absolutely encounter conditions that will put severe stress on anything rigidly bolted to an FG frame, even on market town roads. Most (OK, almost all) North American Commercial Off The Shelf (COTS) campers are not built to the strength of a typical service body. If you are going COTS, you need to isolate that relatively fragile camper from the FG frame somehow. But my guess is that expedition FG campers are only rarely exposed to those kind of extreme frame flex inducing conditions. Real world, full-time overlanding is not about seeking out extreme frame flex inducing conditions. It is very different from weekend or vacation sport 4x4, etc. Most of your time out here is spent on market town roads going from one interesting place to another. Having said that, some of those market town roads would not qualify as roads in the U.S. Things are different out here in that regard. Is it wise to build for those conditions or do as the commercial body installers do? Or, if frame flex is something that should be considered under all conditions and not just extreme conditions, why aren't commercial truck body installers using pivot mounts of some kind? Like any good consultant (I'm still a card-carrying member of the guild), my answer is "it depends." If you know for certain you are staying in North America and you'll be on graded BLM roads, graded gravel or pavement, I don't' think you need to worry much unless you are using a COTS camper. On the other hand, if you are coming out here with a payload that is less than battleship over-engineered, strong and capable, then you should address the issue. You will definitely, without doubt, be put into conditions out here that will take the FG frame to its limits. If you don't want your camper taking those stresses, isolate it from the torsional rotation of the frame. If I had to choose, I'm a lot happier about breaking our truck frame, something you can get fixed literally anywhere in the 3rd world, than our camper, which would have been very challenging to repair. Our 98 FE has been U bolted with several different boxes. We bought it with a dry box, built our own wooden box for landscaping, and currently has a roll off system on it. Both boxes were U bolted and the frame shows no sign of damage, just beginning to lose some paint. I understand that frame flexes but so many rigs out here are u bolted. They dont ever seem to have a problem. Almost everything you will see in this section of the forum is related to the FG. I do not know how the FE frame compares to the FG frame in terms of strength or twisting characteristics. I have never read that section of the documentation. The FG frame is VERY flexible. As Kerry pointed out, for most service/work applications you wouldn't need one. Their primary purpose is to protect relatively fragile payloads such as campers from the twisting of the truck frame. Pivot frames are standard with Unimogs, as their frames also twist a lot. From what I can gather most commercially sold FG work trucks don't have complex and elaborate body mounts. Why are expedition camper builders more focused on complex mounting systems compared to the commercial markets? I've seen the pictures with FG wheels on very uneven ground to indicate frame flex and how pivot mounts handle this flex.But my guess is that expedition FG campers are only rarely exposed to those kind of extreme frame flex inducing conditions. Firstly most flat beds will flex with the chassis somewhat so the stress on the mounts will be less . I imagine a workbody like yours would have alot more rigidity and therefore more chance of damage to the mounts but as you say, you may only rarely be exposed to this kind of frame flexing. That's up to you.Weight will magnify everything but it sounds as though your body has at least been built as Toner suggests and therefore front mount damage should be minimized anyway. To cater for these extreme conditions or not??? We could keep going on about this forever. If you're not worrried then as you say, just wait and see. Good plan. The way your body is mounted , it sounds like IF any damage does occur, as long as you catch it early enough the worst thing should only be a u-bolt failure rather than a major chassis drama. Also most work truck/body builders would never bother with flexible mounting of the cost mainly. The customer wouldn't want to pay for it and often they aren't exposed to the stress anyway. Obviously there would be exceptions to this. Some of our rural fire brigade FG's have 4000litre (more than 1000gal) water tanks on them. Imagine the stress they're under when they fly through the bush to save someones property. Also a camper body (especially a composite one) tends to be very stiff. Due to its construction and shape maybe even stiffer than say your steel workbody (but not as strong). Once you try to twist them with the chassis something has to give. Thanks for all the advice and comments. My service body is attached with 6 u-bolts. Two at the front on the raised portion of the frame, two more not too far back on the dropped down portion and two more near the rear. Also, there is a short extension to the frame (10" or so) of steel channel associated with the step bumper. There is a piece of flat steel welded to the outside of that channel on both sides. It extends up alongside the FG frame about 8". It is welded to the FG frame and there is also one bolt on each side going thru the FG frame. There are two bolts on each side going thru the steel channel extension. The service body frame sits on top of a 1/2" piece of wood (oak?) on top of the FG frame. When I just crawled under there to confirm the attachment I discovered that the left front u-bolt is actually quite loose. I can move it around with little effort. The other u-bolts are tight, to the point of slightly bending the 3/8"(?) steel which butts up against the lower portion of the FG frame. 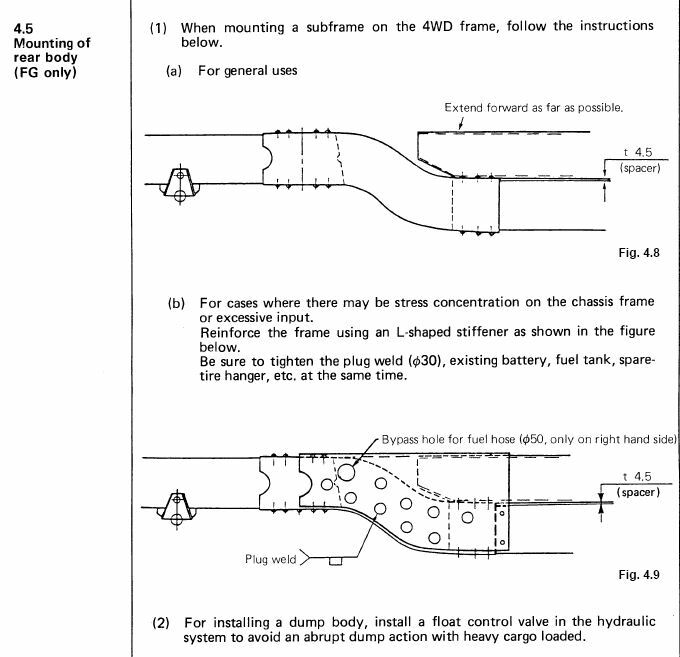 None of the U-bolts have the wooden or pipe reinforcements inside the frame described in the body manual pdf that Doug posted. One of my concerns about spring loaded u-bolts is whether or not those springs will provide enough pressure on the frame to hold things in place. I've seen the one posted here too and I wondered how much pressure those springs provided compared to a non-sprung u-bolt. How would a person go about determining the appropriate size and amount of tension springs installed on the u-bolts would give compared to non-spring u-bolts? i was just doing some research, came across dump beds on the fuso's. then laura reminded me that the truck we ordered susposedly has some reinforcement from the factory specific for adding a dump bed setup if we wanted in the future. i will call pioneer on monday and find out more on what this entails, my question to doug and others is does your frame have reinforcement frame plates located along the drop down curve behind the cab, ours frame does. it goes from just behind the cab all the way down to the straight section leading aft. i'll try and get a pic of this on here monday. 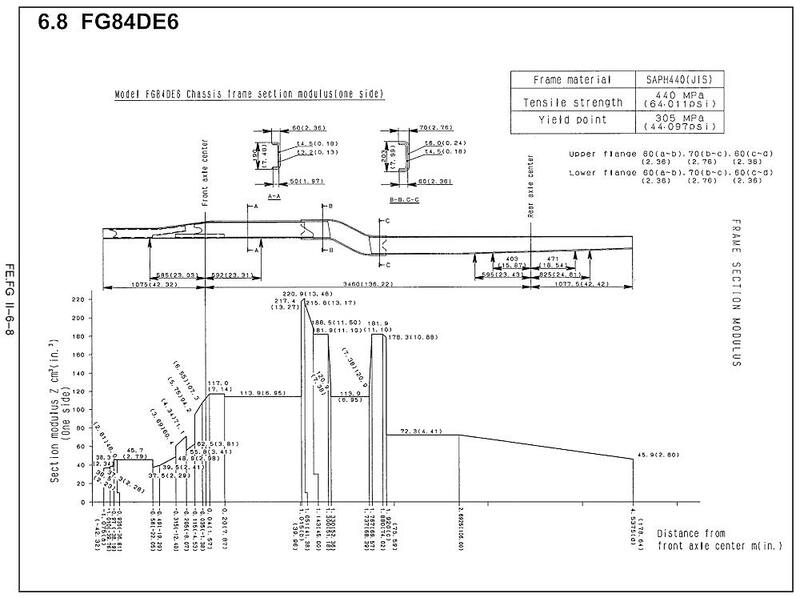 I think what you are seeing is the stock step-down section that is joined by a seperate piece of channel. A step-down reinforcement properly installed for an FG will be plug welded over the step down section. Here's the relevent instructions from the body builders docs. Simple is good. Add simplicity until you have the fewest components accomplishing the goal possible. Provide location between the camper box and the frame on all possible axis of movement, e.g., lateral, longitudinal and axial. That's a fancy way of saying the camper box stays where it's supposed to on top of the Fuso. Provide for independent movement of the Fuso FG frame that does not load, stress or twist the camper box. One of my concerns about spring loaded u-bolts is whether or not those springs will provide enough pressure on the frame to hold things in place. I've seen the one posted here too and I wondered how much pressure those springs provided compared to a non-sprung u-bolt. Kerry, I imagine that the problem with sprung U-bolts (as I said before) will be sideways movement rather than moving fore and aft so you would probably need to add some sort of simple plate arrangement similar to the front of a tipper that prevents sideways motion but still allows up and down movement. That's the whole idea. That old example in the pic didn't look like he had catered for that, but I would, if you intend to go with the sprung Ubolts. 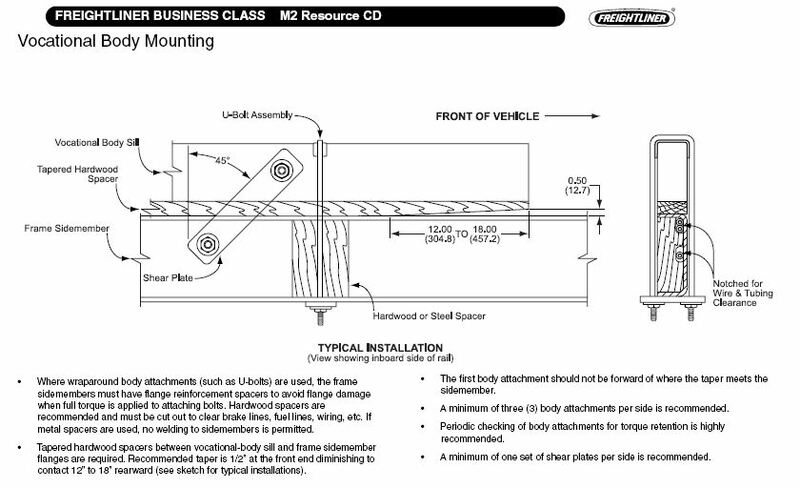 Here's a page from the Freightliner M2 body builder's docs that show the application of a shear plate when using a U bolt mounting system. Doug, Not sure about that one in this case. If the back of Kerrys truck is fixed firmly at the back and we are allowing for some up down movement at the front I think the the shear plate bolts/holes would flog out. I was just thinking about something firmly fixed to the body that comes down alongside the chassis rails but is no way attached to them. I am not qualified to offer anything other than posting the manufacturers documents on these issues. I think anyone who is considering doing this or wants to learn more needs to pick up the phone or send an email to Fuso engineering or talk to a local shop that does this for a living. My guess (note: guess) about the shear plate is that it is used to locate the payload longitudinally, meaning it keeps the tank full of water/fuel or load of rock/dirt or loaded concrete mixer or [insert payload here] from moving foward or backward on the frame if the U bolts are loose. The Freightliner M2 truck in the U.S. can be configured with a GVW of up to 60,000 pounds / 27,216 kilos. That's a lot of bananas. If you keep your U bolts tight it might not be required on a smaller load. Again, best to ask the pros, I am not qualified to do anything but post the docs. If you keep your U bolts tight it might not be required on a smaller load. BTW Remember we are talking about sprung U bolts here rather than the l shear plates associated with normal u bolts. was just thinking about something firmly fixed to the body that comes down alongside the chassis rails but is no way attached to them. That's what I was thinking. On dump trucks I've seen a piece of U channel welded to the dump body frame that comes down around the chassis frame. In my case, there is the additional problem of the hardwood spacer. It is held in place by a piece of U channel on the bottom of the service body frame. ?But that channel is only about 3/8 of an inch deep. So if the body moved upward more than that amount that hardwood spacer could easily become displaced. I'd have to weld on some extensions to that 3/8 channel to keep that wood in place. But wouldn't a spring loaded U bolt design make it all the more important to have a shear plate in the design? No (at least IMO anyway). 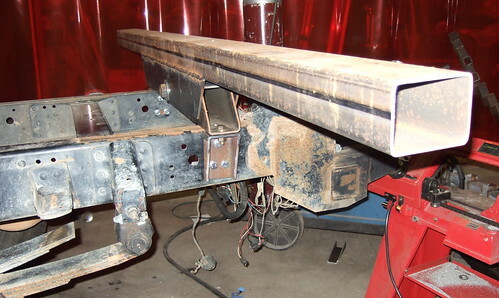 On Kerry's truck, the body is fixed at the rear of the chassis preventing any fore / aft movement. Remember Toner's advice.The shear plates in this case would also restrict free vertical movement where it is needed and by being bolted top and bottom of the shear plate (like the one in the drawing) it doesn't look like it would be effective in preventing sideways movement. At least not as effective as the one's Kerry and I have been discussing. Remember he isn't trying to stop a tray with a 20T load on it from slamming into the back of the cab, > he's trying to allow for frame flex. Doug, Do these docs that recommend the shear plates for use with Ubolts make any mention of fixing the body at the rear? Or are they recommended for the use of Ubolts all the way from front to back? This makes good sense if this is the case. Could you check please, if it's convenient? Interested to know? Not that we are likely to ever use ubolts anyway, but it's good info to post up and I still believe what we are talking about will greatly help Kerry and others with similar ex work trucks. Sorry Just answered my own question. It say in the fine print of that doc that a minimum of 3 attachment points (using u bolts??) per side is recomended. No mention of fixing anywhere. If you think about how everything will move> looking at the drawing , as the chassis drops away from the body with sprung ubolts and the shear plates in place the body will try and move backwards, , Well if it's fixed at the rear and therefore unable to move,the attachment points of the shear plates will just destroy themselves. Sorry for the confusion. I was not referring specifically to Kerry's installation, only to the general concept of using spring loaded U bolts. Other's who happen onto this thread may not be following the specific application (Kerry's) and I wanted to get the shear plate concept out on the table before somebody built using all spring loaded U bolts with no solid attachment anywhere. If it was me, as you suggest, I'd add the type of extended channel/guide you and Kerry are talking about with any spring loaded U bolt system so that the payload would stay latterally located. But again, I am qualified to tie my shoes but not qualified to engineer or recommend anything related to this. For people in the states, there are LOTS of shops that put work payloads on medium duty trucks in the USA. It would pay to talk to a few about what they've learned over the years. The Mercedes Benz Unimog has been produced for over 60 years. It began as a universal power implement/chassis primarily targeted to the agricultural market. It has evolved into a multiple-product line offering that covers everything from its agricultural origins to municipal implement platform to ultra-capable heavy off-road trucks. Some people consider the FG to be a "poor man's Unimog." This is somewhat of a misconception, as the FG is much more of a road truck than an über-capable off-road vehicle such as a classic Unimog. About the closest you can get with that analogy is the current generation UGN series Unimogs. The current generation UGN (U500 in the US) Unimogs are somewhat similar to the Fuso FG. The previous generations of Unimogs, what we all think of when we think of a Unimog, are less so. The current UGNs have ladder frames and standard drivetrains. The previous generations used torque tubes to completely isolate the driveline from the chassis. The classic Unimog chassis itself was designed to be very flexible. All components were mounted with 3 or 4 point pivot systems: motor, cab, payload, etc. The Fuso FG is much closer to a UGN than a classic, old-style Unimog, to which it shares only distant comparitive features (diesel power, 4x4, etc.). Differences between an FG and a UGN include, but are not limited to: 33k GVW, portal axles, lockers, 20/22.5 tires, SRW and a higher frame rail height. The frame on a UGN is still twisty, but the lack of torque tubes means much less isolation between the driveline and the frame. The UGN is less capable off-road than the previous generation. The UGN still uses a 3 or 4 point pivot system for its payload. 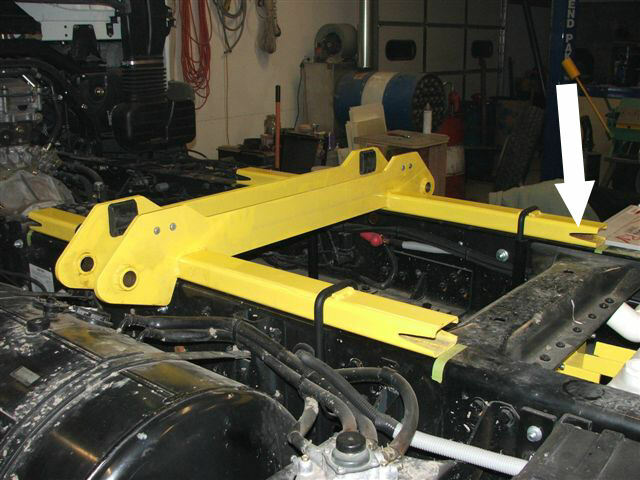 Classic and current generation Unimogs use 3 and 4 point pivot systems to mount components (motor, cab, etc.) and payload(s). Payloads are supported and isolated using a 3 or 4 point pivot system. Some 3rd party expedition campers such as Unicat also use 4 point pivot systems, regardless of if they use a Unimog chassis or not. There is much cross-over in discussion between the Unimog chassis 4 point pivot system and 3rd party, aftermarket systems. the front and rear mounts are on a center bolt, so if you can imagine you have a top cross plate 3 feet long or so mounted to the camper bottom, the other half monuted to the truck frame. i beleive there been many pic's of this shown on this site. now the center mount is a fixed mount across to both truck frame members. o.k. so three mounts are there, now there is a tube welded from the rear camperside bracket to the center camperside bracket, then another tube continuing from the center bracket to the front camperside bracket. well, i'll get one of you to post pic's of this. anyhow, one thing i noticed is most custom 3 or 4 point mounting systems i've seen so far seem to be at the extreme ends of the truck frame. our unimog frame which is the stock setup from unimog has the rear and front mounts in alittle over two feet in from each end. our current plan is to use our 14' flatbed as the top frame supporting the camper fully flat from front to rear, and mount a 4 point system closer in from each end on the truck frame. this perhaps will bring the front mount almost 2.5 feet or alittle more back from the cab right where the reinforcement plates are for the step down frame, the back one will be in from the end almost 4 feet (which includes the 2 additional feet added because of the 14 foot flatbed) putting it very close to the rear spring shackles. with an existing camper frame i beleive there won't be a need for the mounts to be futher toward the extreme ends. our concern at the moment is any up and down movement of the upper frame vs the twist factor of the truck frame between the three mounts. It's been stated in this thread that Unimogs use a rigid mounting in the center and a transverse pivot at both ends. Unicat, at least, which started with Unimogs but now uses all sorts of medium and HD chassis, uses transverse pivots at both ends and a trunnion system at the center which allows fore/aft motion. Furthermore, the right and left female parts of the trunnion are separated so if the two frame members wish to flex differentially in the vertical axis, they can do so. I use the interior of the male tubing which is mounted to the camper to store my sewage hose. I have some notes somewhere regarding 3point vs 4point mounts from when Eddie built my camper mog. A mog typically has a spider frame which 3 point mounts to the frame and gives a rigid platform which you can use for whatever. Initially my box was going to be put on this spider frame but the platform is about 8 inches higher than it needs to be. Eddie was a mechanical engineer and decided to mount camper shell directly to the frame to get the center of gravity that much lower, this is pretty much what unicat and those folks do but I don't know how they decide where to put their mounts. He ultimately decided on a 4 point mount which is rigid in the center and pivoted at front and back. He did a load of tests figuring out where to put the pivots, weather to use 3 or 4 points and where to place the center bar. His reason for moving the pivots around was to find the place that had the least movement in the pivots so he never exceeded them and stressed the box. This is very specific to how a mog frame, specifically a long wheel base 416 and the info may not be applicable to anything else, regardless I'll dig it out and share it. When emailing with him at the weekend I as how much thought he put into the reverse problem of the load stressing the frame/truck. He generally put no thought in to because he was under gross weight and the mogs GVW rating is for an absolute worst case scenario, something 20 degrees of frame twist, off camber, 45 degree hill, locked diffs with a single traction wheel. The only thing he did to the frame was to modify the front cross member as its a common place for a 416 frame to break due to the engine, the suspension mount and the power steering all being in the same area. Unicat uses a transverse pivot in the front and rear and in the center a trunnion that allows fore/aft pitching with a cylindrical rubber bushing. It obviously can't pitch when the frame is in the rest position because the pivots only allow transverse motion. In other words, the frame can twist below the camper but the camper stays steady. These pivots/trunnion(s) are mounted directly to the main frame, there is no subframe. I don't think those kinds of mounting systems could be used with commercial campers like Bigfoots or the Texson I have because the camper itself is not built strongly enough to be anchored directly to the truck frame. Some kind of secondary bed system would be necessary. There's a guy in upstate NY with an FG and a standard delivery truck box converted to a camper. I wonder how his has been holding up. I doubt it has any kind of pivot system. That's the trick, a stress free mount does not require the box to be strong. My camper is made of fiberglass and foam panels. The three/four point mounts themselves are quite big but between them they provide a torsion free platform (3 points make a plane) on which you can much mount the more fragile shell. Doug's Fuso is a great example, its big foot camper that is properly mounted and camper has not suffered any stress. By itself a big foot is not that strong, if that camper was mounted directly to the fuso frame is would have broken apart. The flex is even worse for a unimog (on a mog the engine, trans, cab and everything else is 3 point mounted to allow the frame to flex), my camper has no signs of stress but again if my shell was mounted to the frame it would get torn apart. The only way to mount to the frame is to have a stiff frame to begin with (I think the eco roamer is going down this path) or to have a box that is so strong it will stop the frame from flexing, ultimately forcing a flexible frame to be rigid with a box will cause to something to fail/warp/crack. I understand that the box does not need to be that strong. All I'm saying is that the floors of commercial truck campers are not designed to have 3 or 4 mounts directly attached to them as the sole weight carrying points. They need some kind of frame or bed underneath. I see value in more than three points for mounting a potentially heavy or high inertia structure to a ladder frame in that the point loads are reduced. Most of what I've read in these body builder's links are pointed at making the loads distributed loadings rather than point loads. From a design perspective having the loading introduced to the whole top of the frame rail, as is commonly done with delivery box vans, makes for a more economical frame design. Point loads require that the frame be stronger or that the payload maximum be reduced because they are essentially a bridge spanning the distance between the loading points. What I don't like is that no matter how you do it, more than three points means that you are introducing some torsion or bending into that structure. After three points the odds of any further mounting points always being co-planar aren't real good. 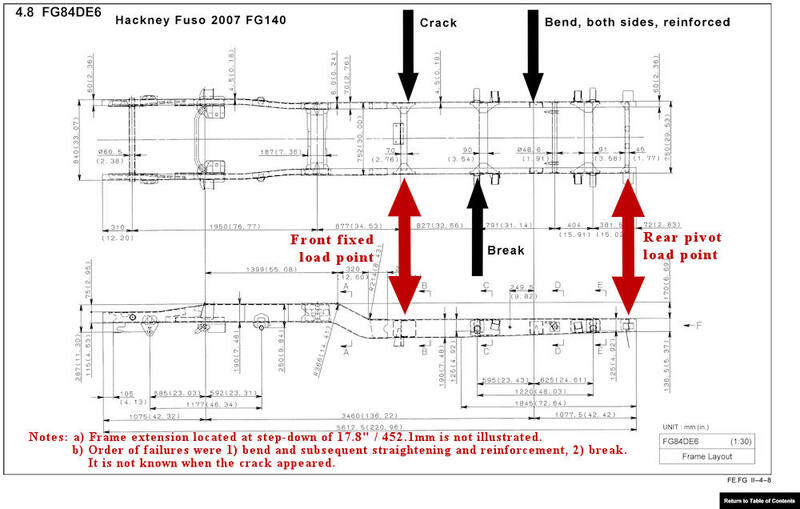 Can always design in some compliance to a joint, but then how much load carrying is the joint doing? Considering this, I'm wondering about a sub-frame that accepts the point loads and distributes them to the truck frame. Cleverly done I suspect that the CG hit would not be significantly more than just the height of the distribution portion of the sub-frame. There is no reason that the joints themselves need to be on top of this sub-frame. Depending on desired "articulation" and the clearances required for that, they could be below the level of the top rail of the frame itself. I just went to measure my 416 frame for a reference..
Its a C section frame, single piece with a bend in the middle, 6.5 inches high, 2 1/8 wide and about 9mm thick. Its difficult to get any info on what a mog frame is made from because Mercedes say if you break the frame you scrap the truck (I think its illegal to fix frames in Germany). The gross weight of a 416 is about 14500 pounds. Attached are pictures of the camper mog mounts, all the weight of the camper is really on 6 points because the front and rear pivots are the cross members so the load is spread to both sides, the center mount spans the frame. The front and back are pivots with a rubber bushing. The center mount is somewhat rigid but it can pitch forward and back on a rubber mount which you can't see it in the picture, its above the bar. The center mount is just in front of the rear axle, the front mount is about 3 feet in front of the center and the rear mount is about 3 feet behind the center and behind the rear axle. You can see the floor of the camper is somewhat structural, it's made of 1 inch of marine plywood but the mount isn't really just a point. The camper side of the mount, which doesn't twist, is a piece of C section about 4 feet wide. The camper is really mounted on 3 bars and not 4 single points, the term 4 point mount refers to how it connects to the frame. In theory I could put a metal plate on the mounts and then put a more fragile shell on the plate (this is kind of what the original unimog spider frame does). Edit: I'll measure a 1300L frame later on, from looking its way bigger than a 416 frame and its gross weight is still fairly low at something like 16000. I forgot this image (you can't add to the attachments in an edit).. This is the frame from the parts manual, my camper attaches to the cross tube immediately to the rear of the bend and the cross member behind the axle/spring mounts. The sway bar goes through the tube in front of the axle/srping mounts and the center rigid mount is directly above this. I will try to answer as many questions as I can in batch mode. a) We had to use a rear pivot point on our 3 point frame because we needed to lock the front of the camper to the garage. If we'd used a front pivot the camper would have contacted the garage or we'd have had to raise the camper to clear it. b) Excellent photos of the legendary mog 4 point system. It's a lot easier to understand with photos. I think for those of us who are not engineers, it's like two 3 point pivot frames locked together and mounted back to back on a limited motion teeter-totter. We were unable to use a system of this type due to the camper/garage interference situation. The garage is rigidly attached to the frame. Our 3 point pivot frame is rigidly attached to the frame at the aft wall of the garage. If we put the entire payload on a new subframe and install it on a bigger truck we will probably use a four point system of this type to avoid having another very long distance between the fore and aft load points on the frame. e) I am in 100% agreement on the superiority of a building full of factory engineers with teraflops of computing power and a test track out back compared to anything we'd do under the shade tree. That is the fundamental reason we bought the FG rather than an aftermarket/3rd party system - it was the only factory 4x4 on the U.S. market. f) The biggest challenge with our 3 point pivot frame design (and I suspect Michel's) is that the rigid front mounts are a very long ways from the rear pivot mount. That means the entire load of (in our case) the camper, most of the external storage boxes and the pivot frame itself is being applied to two widely separated longitudinal points. To make matters worse, from the frame's standpoint, the rear pivot point is way back there where the frame tapers down and its section modulus is low. I think this is where we over-stressed the frame, by applying forces at the extremes of the dimensions of the frame. g) I think the FG is a great chassis. The only problems we've had with anything even remotely connected with Mitsubishi Fuso are things we modified or changed. When we moved house we had a POD with the loose ends, when they bought the pod full there was no issue but when the guy came to pickup the empty he backed off the driveway and high centered the truck. Check out the pictures and the twist on the flat bed, this is what you would call a rigid frame truck. This amount of twist would pop the sides on any fiberglass shell. Pivot frames are interesting, expecially for rock crawlers. But pivots do nothing about washboard and, in my experience, washboard is far more of a problem for long range/term overlanders than twisting. Washboard is fairly rare in South America but it is THE issue in Africa. (To be fair, South America can produce a pot hole or two, but that is not really the same.) I defer to our Australian friends, but it is my impression that the road trains are pretty good washboard makers. I know nothing about Asia. So do spare a thought to your suspension - as in it needs to be softer and better damped than you think. And if so, it will absorb a lot of twist. FULL DISCLOSURE: These comments based on experience with many vehicles, not/not including a Mitsubishi truck. N.B. Like all bad roads, washboard is notoriously hard to capture in an image. Eventually, every single bolt on the car begins to loosen. This is a different problem from grinding through deep holes, etc. Those really do torque your frame. Ideally, you must be able to do both. To quote the Bard: "The heart-ache and the thousand natural shocks; The frame is heir to.."
I've been following the various frame flex; mounting systems; disaster in the making; etc. threads with great interest. • every time the suspension fails to isolate the frame from the environment, stress is introduced into the frame/load. The key to maintaining the integrity of the frame is to change the inputs into the design envelope equation. If we increase the value for the operation environment (rough roads, etc.) we must increase the value for either the suspension or decrease the load (or both). The purpose of mounting systems is to protect the 'box' - it has nothing to do with protecting the frame. The system must be balanced within the design envelope. Flexible frame mounts are required for systems where the operating environment exceeds the capacity of the suspension to isolate the frame/load from the road. Twisting kills the rigid structure - pounding kills the frame. Iandraz, I think your build should address these issues. -- Most of us (that would include me) are more familiar with dealing with rough roads in a Land Cruiser/Rover/Blazer SUV platform. These vehicles have strengths and weaknesses, but the most important point is that they are relatively small and rigid. Such flexing and twisting as they do has little effect on the body or cargo. Everything changes when you move to a pickup/truck chassis carrying a separate cargo. 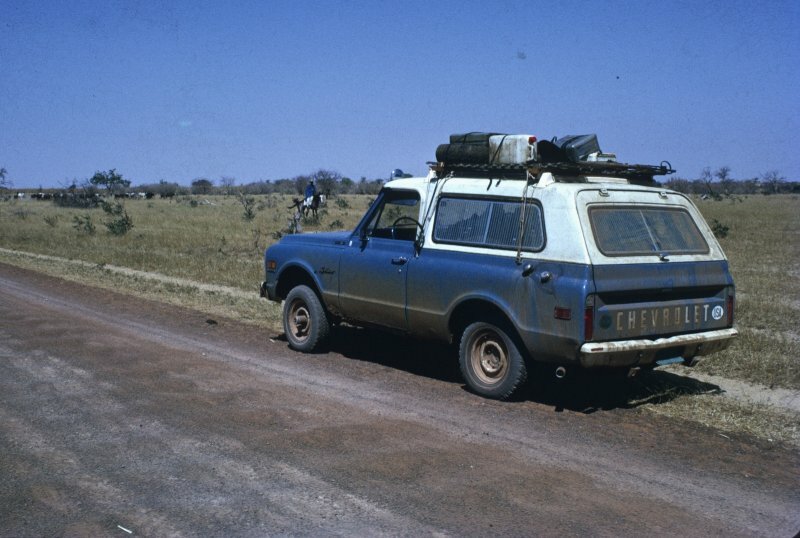 -- Weight and space are always issues as the overlander (as opposed to a weekend camper) is planning travel outside his/her country of origin, probably into less develop parts of the world, and thus needs to carry more heavy stuff (fuel, water, parts, tools, food, batteries, etc.). The amount of stuff, and thus weight, can spiral alarmingly. -- Similarly, the overlander is probably thinking of a trip that measures in weeks and months, rather than hours and days. Thus camper space and comfort and facilities (how long are you comfortable with a squat toilet?) become real issues. Thus the volume of the camper expands and, as everyone realizes, it is much harder to build a large structure that is strong and light. -- As Mark pointed out, there are several systems at play. The easiest is the engine/drive train; they are all pretty good. Unlike the rock crawlers who love to break axles, an adequately sized overland vehicle rarely breaks much. Modern emissions controls, etc., are more of an issue for fuel availability or the annoying halt that follows the sudden failure of some electromagic device. Availability of replacement tires (or resistance to flats) is more of an issue than “off road” traction. While 4x4 is probably essential for strength, most overlanders rarely use 4x4 except for getting to a nice campsite off the road. A quick review of this forum, will reveal, however, that this is precisely what most members worry about. This can lead to an unpleasant epiphany. I have seen it happen in as little as 1,000 km of Saharan washboard. -- The least understood and studied is suspension. 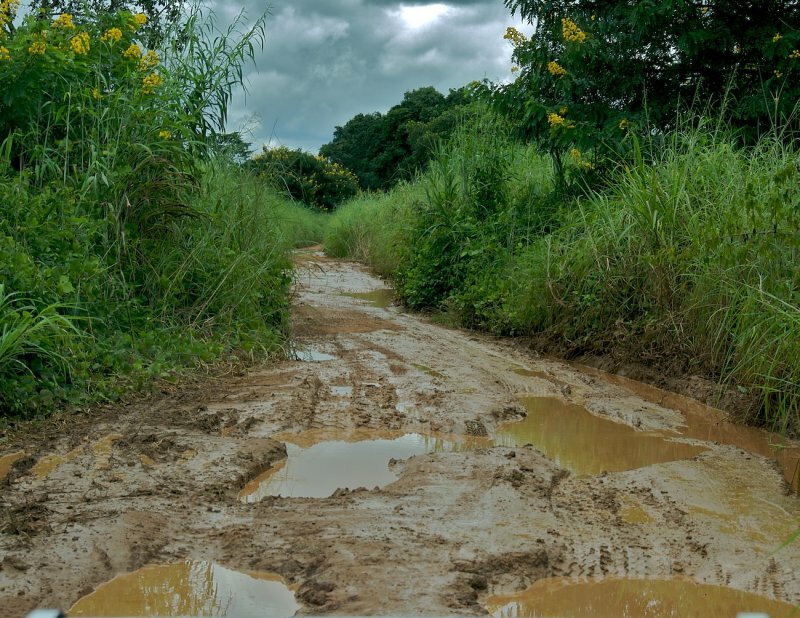 A pity, because, as Mark noted, the right suspension does several essential things: 1) It protects the cargo (human and material) from impact and vibration, and 2) It also allows for the vehicle to keep the wheels on the ground when grinding through mud holes, etc. Many of the companies working in this area focus on getting the vehicle up to allow the mounting of big tires while ignoring the issues of free travel and damping. Again, fine for the local mud hole or the Rubicon trail – dangerous for overlanding. -- In a “perfect” world, an overland vehicle would have a totally compliant suspension tied to a perfectly rigid frame. “Underneath” the frame, everything could move in every desired direction so that nothing would pass to the frame. (Think Citroen DS.) “Above” the frame, nothing would move, so that any cargo, of any shape, size, or strength, could be attached without worry about damage. -- In the real world, the suspension has limits, at which point it passes vibration, impact, and torsion to the frame. In turn, real world frames are designed to bend rather than break, and thus the cabin and cargo must either reinforce the frame or be isolated from it. Or a bit of both. -- Most of the “cargo” that overlanders want to carry is a camper. Most commercial campers are designed to plug and play with a variety of trucks and to be used on good roads. Most commercial campers are not designed to be strong enough to strengthen the frame on which they are mounted, rather they depend on the frame to support the camper. A pivoting sub frame is one clever, proven method of tying a relatively fragile camper. The problem is that a pivot system can be a bit like a dump truck as opposed to a flat bed. The flat bed spreads weight cross the entire frame, while the dump body concentrates it at three or four points and further concentrates it when the wretched mess dumps. Put your rear pivots too far back on the frame, dump while moving, etc., you can see how the forces can multiply. A pivot subframe must be designed to distribute, not concentrate its forces on the factory frame. -- There is no perfect answer, everything is a compromise. -- The goal is to keep the forces and loads, at every point, below the limits of each of your “systems”; suspension, frame, cabin/cargo. -- One obvious point – you need a bigger truck. Look closely at the history of companies like Earthroamer and Provan. They have to warranty their products and they lose money and sales if they fail. Both companies have steadily upped the size of the truck that they use, WITHOUT increasing the size of their camper. There is a message here. If it were cheap or easy, the commercially available overland campers would not be so $$%%# expensive.